So, I'm out on my morning Internet constitutional, visiting all my favorite Clay Aiken sites. My first stop is, of course, The Clay Aiken News Network. I open the page and BAM!!!! There's Clay in THAT blue shirt - you know the one, worn on the Independent Tour in Miami. It was the first, last and only time that Clay wore that ensemble. 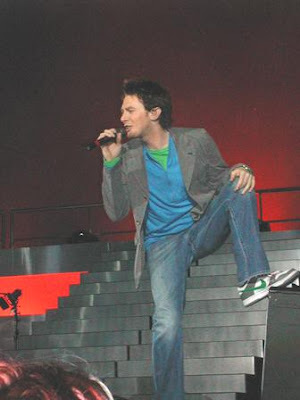 Here's a little bit more of Clay Aiken, THAT blue shirt and When Doves Cry (featuring several clips, including the Green shirt and that OTHER blue shirt).. Sue.........I loved the blue shirt outfit that he wore in Miami!! He looks good in both blue and green and that was a greaet outfit Clay wore that night in Miami. Great blog! IMO Clay Aiken could wear a burlap sack and look good. I really do love the blue shirt outfit tho! I loved that green/blue shirt! I never realized it was the only time he'd worn it. Thanks, sue, for the up to the minute Clay Aiken facts!! Great shirt and great tour by Clay Aiken. Sue, your blog is great. Keep up the good work promoting Clay Aiken. Clay Aiken just looks good in any color, he is so photogenic. Wonder why my comment didn't go through lets try again. I love that first picture of Clay Aiken! You come up with some of the best pics and videos! I liked that shirt, too, although I didn't see it in person. Clay Aiken can wear any color, but I wouldn't mind if he would ditch the plaids!